The rosy minivet (Pericrocotus roseus) belongs to the family of cuckooshrikes and minivets, the Campephagidae. The rosy minivet species is distributed in Pakistan, India, Nepal, Bhutan, Bangladesh, Myanmar, Thailand, Laos, Vietnam and China. These minivet species are partial migrants. These minivets are monotypic species. The rosy minivet (Pericrocotus roseus) is a medium-sized minivet, measuring 17 to 20 cm in length and weighing 15 to 20 gram. These birds are sexually dimorphic. These species have pale gray head, neck and upper back. The lore is dark gray and passing through the eyes extends to the nape. There is a thin very pale gray supercilium. The chin, cheek and throat are whitish. In adult male rosy minivets the forehead is whitish. The rump is reddish and the uppertail coverts are red. The underparts are rosy. There is a broad red wing patch. Some primaries as well as some tertiaries have red lines extending along the fringes. The females have the red and pink plumage replaced by yellow. The juveniles are paler. The bill is black. The irises are dark brown. The legs are black. Their call is a squeaky, whistling "whiririri-whiririri-whiririri" sound. The rosy minivet species is distributed in India, Pakistan, Nepal, Bhutan, Bangladesh, Myanmar, Thailand, Laos, Vietnam and China. In India, these minivets are distributed in the states of Jammu and Kashmir, Himachal Pradesh, Punjab, Haryana, Uttarakhand, Uttar Pradesh, Madhya Pradesh, Maharashtra, Telangana, Andhra Pradesh, Odisha, Chhattisgarh, Jharkhand, West Bengal, Assam, Meghalaya, Arunachal Pradesh, Nagaland, Manipur, Tripura and Mizoram. The Important Bird and Biodiversity Areas (IBA) of these rosy minivet species in Nepal are Bardia National Park, Chitwan National Park and Dang Deukhuri foothill forests and west Rapti wetlands. These rosy minivet species have moderate forest dependence. They normally occur in altitudes from 0 to 1000 meters. The artificial ecosystems and habitats of these species include, plantations, urban areas and rural gardens. 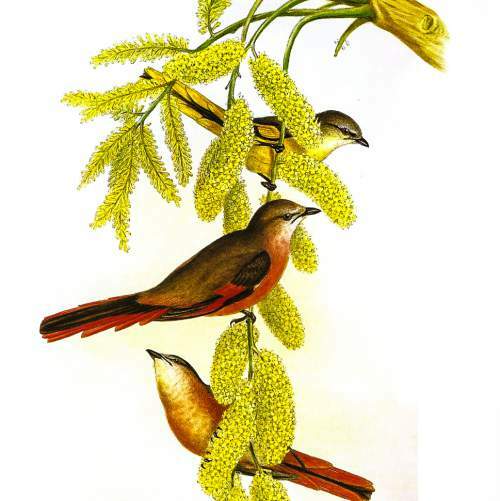 The natural ecosystems and habitats of these rosy minivet species include, tropical and subtropical moist lowland forests, tropical and subtropical moist montane forests, broadleaved forests and deciduous forests. The diet of this rosy minivet consists mainly of insects. Insects, insect larvae, grasshoppers, locust, cicadas, crickets, beetles, spiders, ants and termites are their primary food. These birds forage on the canopy and mid-storey by gleaning insects from the foliage and branches. The breeding season of these rosy minivet species is from April to June in India. The laying season is in the month of April in Myanmar. These birds are monogamous. The nest is built on tree branches and most of the nest building is done by the female. The rosy minivet nest is small, deep, cup shaped structure, built with roots, twigs, rootlets and grass. The clutch contains three to four eggs. Both the parents incubate the eggs and raise the young. The chicks hatch out after 14-15 days. These rosy minivet species are partial migrant birds. The breeding populations are found in south and southwest China and northern Vietnam. They move southwards for wintering. 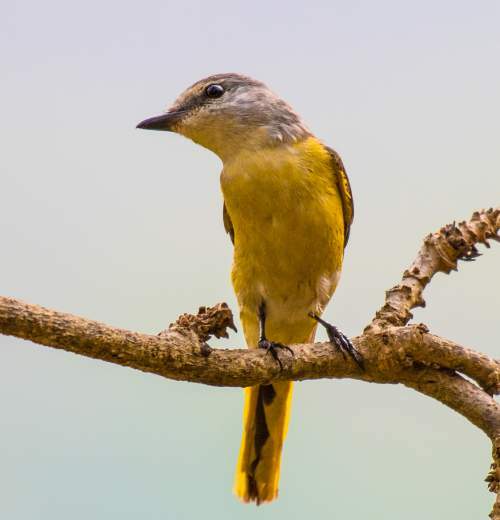 The native non-breeding populations of the rosy minivet species are found in central and eastern India, Bangladesh, south of northeast India, western and southern Myanmar, Thailand, Laos and central and southern Vietnam. Native resident populations of the rosy minivet species are distributed in northern Thailand, northern Laos, northwestern Vietnam, northeastern and central Myanmar, northern northeast India, Bhutan, Nepal, north India along the Himalayan foothills, northwest India and north Pakistan. The global population size of the rosy minivet (Pericrocotus roseus) has not been quantified. The overall population trend of the species is considered to be stable. In most of its range, this minivet species is reported to be fairly common to rare. The generation length is not known. Its distribution size is about 3,630,000 sq.km. Habitat alteration and destruction, fragmentation of the habitats and trapping for pet-trade are the main threats that are endangering the survival of these minivet species. The rosy minivet (Pericrocotus roseus) does not approached the thresholds for being Vulnerable either under the range size criterion, or under the population trend criterion, or under the population size criterion. The IUCN (International Union for Conservation of Nature) has categorized and evaluated the minivet species and has listed it as of "Least Concern". 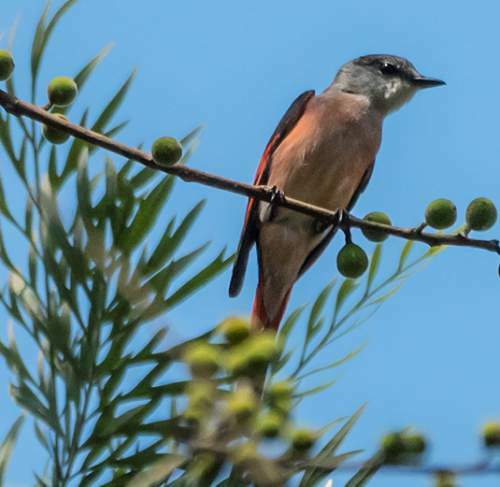 The CITES (Convention on International Trade in Endangered Species of Wild Fauna and Flora) status is ‘Not Evaluated’ for rosy minivet (Pericrocotus roseus). The rosy minivet (Pericrocotus roseus) is closely related to the ashy minivet (Pericrocotus divaricatus) and the brown-rumped minivet (Pericrocotus cantonensis). Current topic in Birds of India: Rosy minivet - Pericrocotus roseus.